Print this Merry Christmas greeting card at home or at a photo printer. A vintage stripped design with soft colours makes up the background for this holiday card. Two polaroid photo frames will hold one or two of your own photos. The perfect holiday card to send to your friends and family this year. The card wording and colours can be changed upon request. Merry Christmas From the Kringle's. 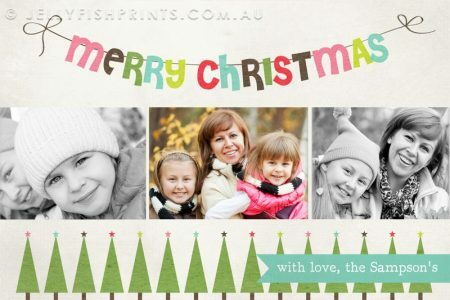 Share your Christmas Holiday Photo Cards with family and friends. The top banner joyfully spreads your well wishes for a Merry Christmas with bright coloured letters. Your 3 photos are centered with a delightful row of Christmas trees along the bottom to add to the holiday season theme. A second blue banner in the bottom corner of the card shares whom the card is from. This multi-photo design allows you to insert 3 photos. They can be taken at home or current holiday pictures. We can perform any minor photo edits (fix red eye, brighten your photo, make it black and white) for free. We highly recommend having your photo cards printed at an online or local print shop. Kmart and Big W are convenient to most shoppers. Your printable Christmas holiday photo cards will be personalised with your information and photograph if applicable. We will email your completed high resolution invitation within 1 Business day.